University of Lahore is a notable private university of Pakistan. It has been ranked in top ten best universities of Pakistan and also globally. It was established in 1990 by M.A. Raoof. UOL has two three campuses in Lahore, one in Islamabad, Sargodha and Pakpattan. 25, 000+ students are completing their education from it. Lot of scholarships and financial assistance is provided to the students. There are many extra-curricular societies and clubs established within the University. It has started lot of international research programs and is publish lot of journals, books, newsletters, press releases and other category of scholarly material. University of Lahore has also attracted lot of international students. They come from the neighboring and also from other Muslim countries due to having modern technological equipment and the state of art facilities. University of Lahore offers higher education at all every levels. There are many short courses available for the national and international students. Overall academic staff of the university is 1000+. Other categories of professionals are also needed for the university which could be from medical, technical and other fields. University of Lahore is a dynamic organization for working. It is directly affiliated with education and research. Internship positions are also available for the students and those who are starting their career. Applicants have to email their CVs to the human resource management. Application forms can be downloaded from the website of University of Lahore. There is extremely fierce competition between candidates now a days for the jobs. Applicants are finally selected after interviews. 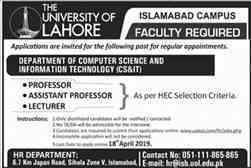 ilmkidunya is the regular publisher of University of Lahore Jobs on the web. View the latest vacancies below.